Victoria, Mahe (Seychelles) – October 29, 2018 (travelindex.com) – Sunday the 28th October saw the World of Creoles celebrate their International Creole Day. From the Indian Ocean Vanilla Islands, to the Caribbean and even to New Orleans in Louisiana USA and Cabo Verde it is all proud Creoles who has the right to celebrate their identity and culture. A question on this historic Creole Day is “Where does the International Creole Day come from?” An article posted by ARCHIPEL MEDIA on SEPTEMBER 30, 2017 October 28th: ​​INTERNATIONAL CREOLE DAY «BANNZIL KREYOL» says it all. In 1979, an international conference of Creole studies bringing together linguists from around the world took place in Seychelles. Subsequently, in 1981, scientists whose mother tongue was Creole began to ask questions about methods that could promote the Creole language, after a symposium organized by the International Committee of Creole Studies, where the theme of reflection was: “Creole, creoles, continuity and creativity in the Creole world. ” On October 28, 1981, at the third conference, at the Old Port in Saint Lucia, the Creole speakers decided to join together to create a movement that took the name of: BANNZIL KREYOL. And it was decided to hold October 28 because this date had previously been retained by the Dominicans to celebrate a “Creole Day”. 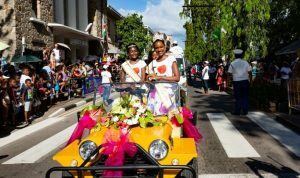 In 1982 the Seychelles government organized a Creole week, the same year the movement BANNZIL KREYOL wrote its founding texts in a quarterly bulletin. October 28, 1983 was the first day of BANNZIL KREYOL. The first “International Creole Day” was celebrated in 1983, in a rather haphazard way. However, from year to year, the implementation of this day has improved and is, in some countries, the occasion of quite significant and interesting events. Since then, the day of October 28 is celebrated in all the countries of the Creole world. Many countries today are celebrating this day for a week, highlighting the highlight of the day on October 28th. Seychelles is currently in the middle of its Festival Kreol 2018, a celebration that sits annually on the island’s calendar of National Events. Last Saturday it staged its Laserenad (Festival Parade) in Victoria, an event that continues to be the highlight of the Festival. Reunion Island is the only Indian Ocean Island opening economic offices in Member States of their Vanilla Islands Grouping. President Didier Robert, the Regional President of Reunion must be congratulated for working hard to open doors for the business community of Reunion and in so doing create employment for the Reunionais. This drive by Didier Robert is an example because Reunion products, their know how and also the promotion of Reunion Island as a tourism destination in its own right cannot just happen by itself. It is such endeavours where the island’s presence is seen and remains visible that Reunion can be relevant. Reunion Island has inaugurated its regional antenna office of Seychelles, in Victoria. This is the fourth antenna office in the Indian Ocean which ensures a presence of Reunion in the countries of the Indian Ocean Commission (IOC). The Réunion Region office is located in an office on the third floor of the Espace Building in Ile du Port. Its role remains to facilitate the links between the Reunionais companies and the Seychellois actors, either in the public or private sector. The inauguration of the Seychelles office took place in the presence of Mr Vincent Meriton, Vice-President of the Republic of Seychelles, President Didier Robert, Regional President of the Réunion, and Mr Lionel Majesté-Larrouy, Ambassador of France to Seychelles. Also present were Secretary of State for Foreign Affairs Barry Faure, ministers and members of the diplomatic corps. The installation of this antenna Réunion Region in Seychelles is within the framework of a program of European territorial cooperation – INTERREG V Indian Ocean. Among the objectives, the antenna will host Reunionais companies on a prospecting mission and who wish to set up or form partnerships in Seychelles. With the opening of its antenna in Seychelles, the community now covers the entire Indian Ocean Commission, because similar antennas were established in Madagascar, in Mauritius and in the Comoros. Seychelles will prioritise local tourism players to stimulate growth? Seychellois businesses in the field of tourism have been urging the Government of the Seychelles to efficiently identify and harness the tourism resources of the islands to create sustainable development for Seychelles. This call is not new, but recently the tourism industry players have been meeting leaders to put their case on the need to consolidate tourism, the industry that remains the pillar of the Seychelles economy. Meetings with VP Meriton by some, and with Heads of Government Authorities by others and even going as far as having recourse to the Judiciary by a company are all taking place with the aim of stimulating growth in the Seychelles Tourism Industry instead of stifling the industry that Seychelles and the Seychellois people so depend on. The 5-Room limit set for La Digue some years ago is being questioned as it is seen as an “economic strangulation” of establishments. The vertical integration regulation is seen as the blow now referred to as the “coup de grace” Seychellois entrepreneurs did not need over and above continuing rising costs in operation, shortage of staff and the bureaucracy that it entails to recruit foreign workers (one establishment citing up to a three months waiting period), and the waiting time for necessary authorisations for new developments even when the Authorities in Seychelles know that they should be on their knees to push for more local investments and also FDIs (Foreign Direct Investments). Seychellois entrepreneurs in tourism such as Joe Albert and his son Guillaume, Kathy Mason and her son Alan, Mary Geers, Guy Savy of Bird Island, Gilbert Frichot and his partner Corola among others seem to have made the decision to task themselves with the commitment to continue to work for Seychelles to help prioritise the development of tourism in all its facets. In Seychelles today abandoned and untapped tourist sites, properties and facilities are not improving the different villages’ economy and help Seychellois build a future for themselves and grow the country’s economy. Other serious investments and investors in the Seychelles such as the Raffles Seychelles of Praslin, H-Hotel of Beau Vallon Mahe, Club Liberte Casino at Four Seasons Seychelles and Avani Seychelles Barbarons Resorts and Spa among others are seen as examples of marrying foreign participation in an industry that is the pillar of a country’s economy. They are working hard and are being innovative and pro-active, but know that Seychelles has but one tourism industry and it is together (private & public sector) that the islands will make the difference in the competitive world of tourism. I was recently speaking within an interview on “improving facilities, opening tourism opportunities & relooking at the word facilitator when the island’s government is involved to ensure a better tourism management approach” and can say that I appreciate the seriousness of the situation on hand in Seychelles. The tourism industry players ought never to be quite happy with the obstacles, with the lack of understanding by the facilitators, with limited infrastructure and below accepted level of services coming with today’s over the top rates, fees and licenses. The tourism industry players and their staff need to sit together to propose bold making and sound policy framework which will continue to make tourism THE essential component of the Seychelles development agenda. Advocating a solid vibrant policy framework to reenergise the sector as mandated by the people who are always the first to feel the effects of any downward trend in the island’s tourism industry. It is this that is now needed by Seychelles for the development, management, regulation and marketing of sustainable tourism and tourism related services and for connected services. Praslin and La Digue Islands has a need to seek to mobilise revenue collected by the state on their island’s Parks and Gardens to implement their development agenda. It is important they find innovative methods to be part of and to then fully exploit their island treasured resources to assist development of their island by their island. The same can be said for other business groups and associations. in the different parts of the main islands of Mahe. It is time to challenge stakeholders in the tourism industry especially, and their district business committees to look to work more together to accomplish more to greatly help raise their island visibility and make the islands more relevant as tourism destinations. In so doing see the reflection of the contribution of their sector to national development will be better recognised.